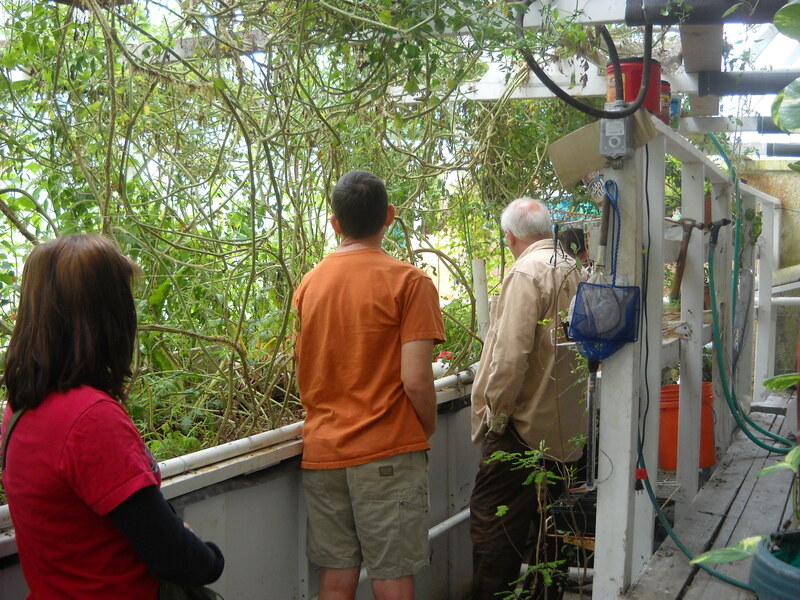 Today we had a great tour of Clint’s system in Red Oak, TX with the membership of the DFW Aquaponics meetup group. We had almost 25 people show up for a two-hour tour of his system and then an informal Q&A session with Clint and Adam. Clint’s current system is the culmination of almost four years of tinkering and redesigning components to make everything work efficiently and effectively in the space that he has available… And boy does he have space available! His greenhouse is located on a nice bit of land where Clint keeps himself busy with his aquaponics, goats, horses, chickens and a number of other projects. He himself was bitten by the aquaponics bug about 6 years ago and that was when he began reading every piece of information that he could find on the web. Then about four years ago he built his greenhouse and began his practical education with aquaponics. (Read his story here.) Now, he says that he has learned a great deal, but he is always looking for a way to increase his grow space, or make his system more efficient. As a moderator on the popular forum AquaponicsHQ, he ever willing to help others develop their own systems using his own experiences and vast background knowledge as reference points. Our tour started outside of his Earthship-inspired greenhouse, which is built of cinder blocks and polycarbonate greenhouse panels. The first thing that we saw was his “outdoor” system loop. While this portion of the system can be run independently, it is also plumbed to utilize the water from the massive tank housed in the greenhouse. Growing in the eight 4’x4′ outdoor beds are a variety of plants – Swiss Chard, Cabbage, Spinach and Lettuce which are an expected site in a winter AP system; to onions, garlic, and daikon radishes all of which are not that common. As we walked inside, we were instantly greeted with a 15 degree increase in temperature (a welcome change from the ~55 degree weather outside) and our first sight of a massive fish tank and a veritable wall of tomato vines rising to the ceiling. The massive fish tank holds almost 5,000 gallons of water and is used for both breeding and grow-out of some of the most massive Mozambique Tilapia that I have ever seen. (I swear that some of his fish topped 3.5 pounds!) Additionally, there are some monster channel catfish in there that serve as a clean-up crew for excess food and waste. The water is circulated through a series of loops that take the water though a very large U-shaped media bed that is run fully flooded – Clint has found that his plants do wonderfully in these beds and no longer bothers to use the traditional flood-and-drain systems he initially put in. From the beds the water drains to a sump and then back to the fish tank through a series of filter beds that hang in the rafters over the fish tank. In my opinion, this is one of the more ingenious creations of Clint’s – the water drains out of these into the fish tank through a spreader bar that stretches the length of the 15 foot tank. The aeration of the surface is impressive. All in all, this was wonderful meet-up, and that does not even count the fresh Tilapia ceviche and cranberry scones or the conversations that ensued among those present as we all worked to understand everything that Clint has done. If anyone else wants a tour — all you have to do is ask and we can set up another one! I would swear that I saw that a tour would be held on Feb. 26. Do we need to register? Please let me know. I have four to eight people that are interested in going. Actually on February 26th, we are not having a tour of a system, but rather it will be a workshop where we will build a system from the ground up. The cost is $30 per person, but you will walk away with the complete plans to build the system and I will have certain system components (IBC totes and Uniseals among others) available for purchase as well. The link to make your RSVP is through the DFWaquaponics meet-up group (HERE).) Hope to see you all there.